with the typical bales of hay which appear in every golden field by mid July. The Maremma is a vast area in Italy bordering the Tyrrhenian Sea, consisting of part of south-western Tuscany - Maremma Livornese and Maremma Grossetana (the later coincident with the province of Grosseto), and part of northern Lazio - Maremma Laziale (in the province of Viterbo and Rome on the border of the region). The poet Dante Alighieri in his Divina Commedia places the Maremma between Cecina and Corneto, the former name of Tarquinia. It was traditionally populated by the Butteri, cattle-breeders who until recently used horses with a distinctive style of saddle. Once unhealthy because of its many marshes, the Maremma was drained during the fascist regime and re-populated with people coming from other Italian regions, notably from Veneto. Endowed with significant natural and environmental resources, the Maremma is today one of the best tourist destinations in Italy, a region where ancient traditions have survived and Tuscan culture is preserved. It is being promoted as a destination for agritourism. In the Maremma region various popular wines are produced, some of which gained DOCG status, Montecucco, Morellino di Scansano and Maremma Toscana. When it comes to Tuscan wine, organic varieties have found important applications and supportive enthusiasts and the Maremma boasts great organic farms and biodinamic vineyards. The Maremma Grossetana can be divided into 5 main areas, each with its own characteristics and attractions. * Alta Maremma (Upper Maremma) is the northern part of the Maremma region, right on the border with the Province Siena. This area is characterised by the many picturesque hilltop villages (Pitigliano, Roccastrada, Roccatederighi, Sassofortino, Monte Massi, Massa Marittima, Cinigiano, Campagnatico, Pari), which remind of the hilltop towns of the Siena area. * The heart of the Maremma . Grosseto can be considered the capital of the Maremma. 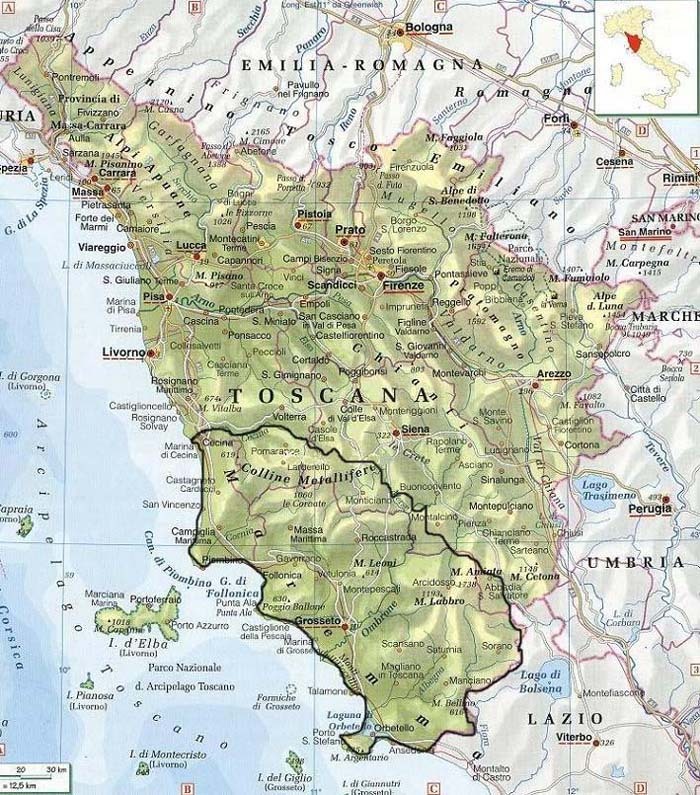 The area around Grosseto and the coast, with Marina di Grosseto, Castiglione della Pescaia and the small villages that lie in the plain between the city and the coast, represents the heart of the Tuscan Maremma. * The hills of the Upper Maremma . The hills the Maremma can be divided into three areas: the area del Tufo (tufo is a volcanic rock found in the area that has been used for thousands of years in construction), the Colline Metallifere (literally, "the hills that produce metals") and the internal hills on the border with the Siena region. This is the heart of the Etruscan Empire (many would debate that the heart of the Etruscan Empire was actually in the Maremma Laziale, in an area also known as the Tuscia, where Tarquinia was "the chief of the twelve cities of Etruria"Tarquinia). * On the shoreline of the Maremma sandy beaches alternate with rocky coastline. The long stretches of pine tree forests which border the beaches of the Maremma are a naturalistic treasure as well as the few areas where the lagoon and swamp ecosystems have survived urbanization, reclamation or simple draining, such as the nature reserve of the Diaccia Botrona near Castiglione della Pescaia. * The metalliferous hills : The Colline Metallifere (literally, the metalliferous hills or the hills which produce metals) have always been the industrious heart of the Maremma and some places still point to times when the life on these hills was much harder. As their name says, the soil of these hills, which spread from the border with the province of Siena to the Gulf of Follonica, is rich in minerals and mines have been excavated for centuries in search of iron, copper, lead, zinc, pyrites and silver. The main town is Massa Marittima. One of the most interesting areas of Tuscany, between Follonica and Castiglione della Pescaglia, thanks to its beaches, tourism port at Punta Ala and the Etruscan monuments at Vetulonia. This area is also very interesting for its nature, with the State Natural Reserves of Tomoboli di Follonica and Scarlino, including the inlets of Cala Martina, Cala Francese and Cala Violina. The hinterland of Castiglione della Pescaia hosts one of the most important wetlands of the Tuscan coast: the Natural Reserve of Diaccia Bortona, where the small WWF Oasis of Marze is located. Beyond the historic centres of Castigllione della Pescaia, Vetulonia and Scarlino, the villages of Buriano and Tirli as well as isolated archeological monuments like the Roman villa of Puntone and the Etruscan necropoli of San Germano and Poggio Tondo are all worth visits.